A number of culinary students from the T A Marryshow Community College are now more knowledgeable about various aspects of planning and designing of a restaurant or food service area. Sandals LaSource welcomed an enthusiastic class of culinary students from the T A Marryshow Community College on 6–7 & 11 March 2014, for a culinary journey they are unlikely to forget. The objective of this visit was to develop in the students an awareness of all aspects of planning and design in the refurbishment of a foodservice area or restaurant. Seventeen students and two instructors Ms. Natifa Modeste (Food & Beverage Service, Accommodations and Housekeeping) and Ms. Pam Conover (Culinary Arts Instructor), were hosted by acclaimed Sandals Resorts Executive Chef Glenroy Walker, and Food & Beverage Director Vincent Moreau, through a practical understanding of the choices available in industrial practices, associated with restaurant concepts, design and renovation of existing facilities. 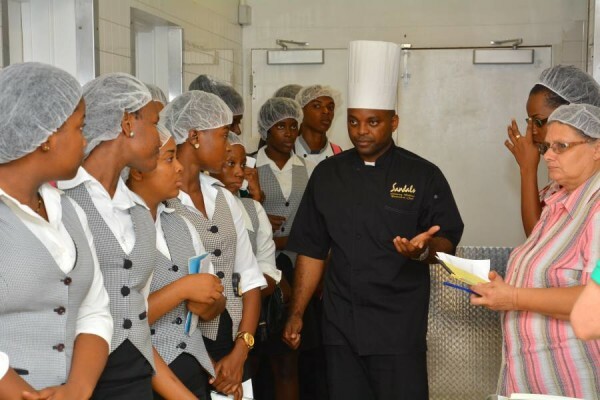 In addition, students evaluated energy management principles with particular reference to energy cost and maintenance of the equipment selection for the new kitchens given Sandals commitment to best environmental practices and adherence to “Earthcheck” guidelines. “As a Kitchen Organization and Culinary Arts Academic Advisor, I could not have had a better application of course concepts in a live demonstration of restaurant renovation and design principles. Students were able to see first hand the effect of the Chef’s influence, service, product flow and efficiency on the guest experience,” said Ms. Conover. The group was also introduced to the Discovery Dining concept embraced by all Sandals Resorts. The impressive array of cuisine produced on a daily basis at Sandals LaSource allow guests nine dining options ranging from the freshest seafood, regional Italian, Thai, Sushi, French Haute Cuisine, Southwestern, Mediterranean Rim, British Pub, Caribbean and even a decadent French Pâtisserie and Crêperie. As Chef Walker puts it, “Guests do no simply eat at Sandals. Each dining experience is a unique journey of cultural discovery to other parts of the world right from your table.” Each student is expected to submit a report on an assigned restaurant concept based on observations during their visit which will form part of their course project.